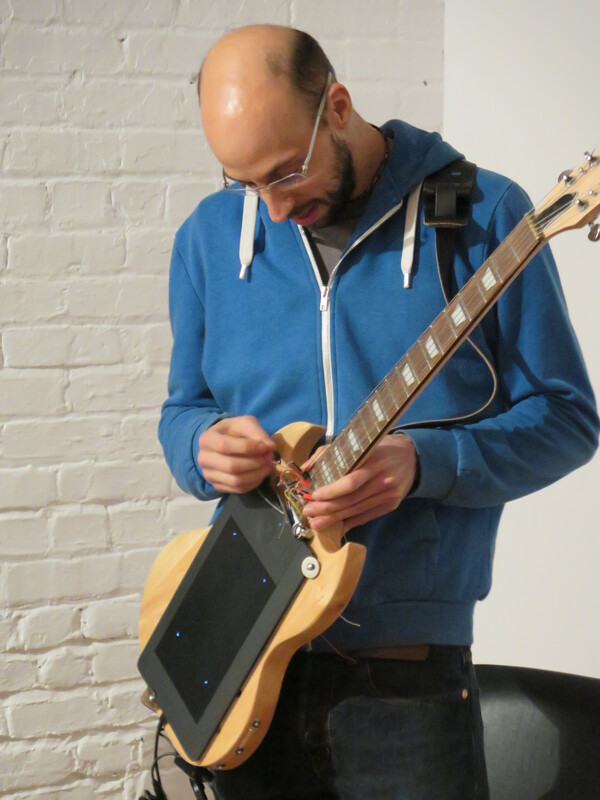 Thank you for joining our first re-inauguration of Dorkbot MTL! Our first Dorkbot meeting in 6 years and I couldn’t be happier. Our host, Oboro was fantastic and very welcoming. We even had a nice little sound track of the choir singing down the hall. Our first presenter, Mike Hornblow, brought us straight to Japan using Google street view, toured us around the globe and ended with video’s of our own hands- all while presenting some uber fresh research being conduced at Concordia’s Senslab. Our second presenter, David Raby_Pepin, shared a group of event based installations that playfully had audiences question concepts such as immediacy, presence, digital representations and notions of “liveness”. Claire Kenway, our third presenter introduced us to Windcatcher, her electronic music making instrument powered by the sun and wind. We weren’t sure if we would have a fourth presenter but he arrived half way through with a rather large, heavy looking box. and his guitar a crayon really was the cherry on the cake. Video’s of all the presentations will be up shortly. Thank you to everyone who came out to the meeting. Please share with your fellow Dorkbot inclined friends and we look forward to seeing you at the next Dorkbot- [the second Tuesday of the Month, every two months]. Next Meeting: June 10th, 2014.